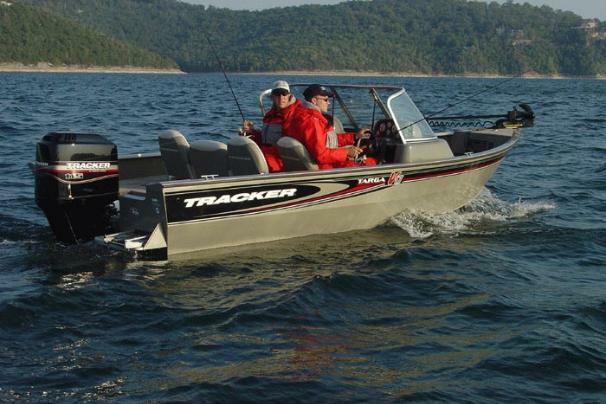 Boat Description Our mid-sized Targa 17 WT offers Deep V width, stability and confident handling in a wind- and spray-protected walk-thru windshield design. The storage in this rugged 17-foot fishing boat is phenomenal: centerline rod storage, extra-deep rod and gear lockers on both sides plus spacious storage boxes in the bow and floor. This serious tournament contender includes a Mercury Pro Series outboard, tilt steering, Lowrance X47 fish finder, Minn Kota foot-controlled trolling motor, two-tray tackle management system, 19-gallon bow livewell with baitwell, 28-gallon aft livewell with baitwell insert plus custom trailer with EZ lube hubs, GalvaShield protection and swing-away tongue. Dry Weight 1480 lb approx.